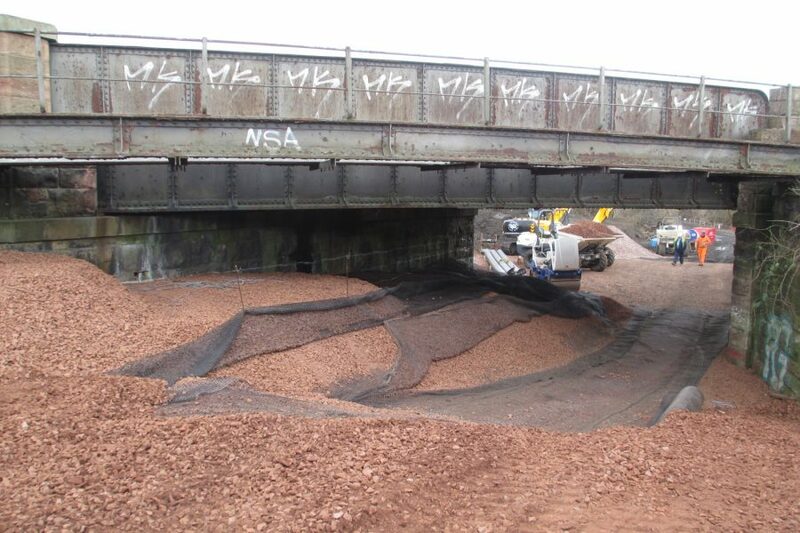 The commission comprised structural inspections, coal mining investigations and design of remedial works at a rail underbridge to the south of Edinburgh. The coal mining investigation itself included a desk-based review of mining records and an intrusive ground investigation. The design phase comprised a specification for consolidation of identified workings as well as design of stabilisation works in the form of infill beneath the bridge to form a reinforced earth embankment. A Temporary Works design for a crane pad was also carried out. The structural inspections revealed that the underbridge was showing significant signs of disrepair, with large cracks evident on the wing walls. Subsidence relating to collapsing mine workings had previously been remediated. The remit called for removal of the bridge and replacement with an embankment. The coal mining assessment was carried out by JWH Ross (specialist mining consultancy branch of Fairhurst) and mine workings were positively identified. A specification was produced for consolidation of the workings. The overall remedial works design had to account for two major factors: the first that the embankment works were to be carried out prior to completion of the consolidation works and therefore had to be able to withstand a collapse, and the second that the works had to be carried out within a single weekend possession. To address the first issue, the earthworks specification for placement and compaction of 6N fill had to include for encapsulation within a Stabilenka geotextile. To address the second issue, the majority of the void beneath the bridge was infilled while it was still in place. This required small compaction plant in the upper layers, in turn requiring modification of the specification to account for the thinner layers. Fortrac geogrid was specified in the upper layers within the track support zone. The Temporary Works design for the crane which would lift the bridge during the weekend possession was also required.